Crusader Prime and Wraith on the scene. Photo by Megan Boguszko. Every year at this time, we read a lot of heartwarming stories. For at least a day, political differences are set aside. But Christmas comes and goes, and the petty squabbles return, along with the ugly divisions. It all solves nothing and no matter who is in the mayor’s office or running the country from Washington, at least half of the public seems angry. For those with real hardships, Christmas can be a brutal reminder of what they don’t have. I’m talking about the homeless, right here in Chicago. The reasons vary, and solutions to it are always debated, but the fact remains. 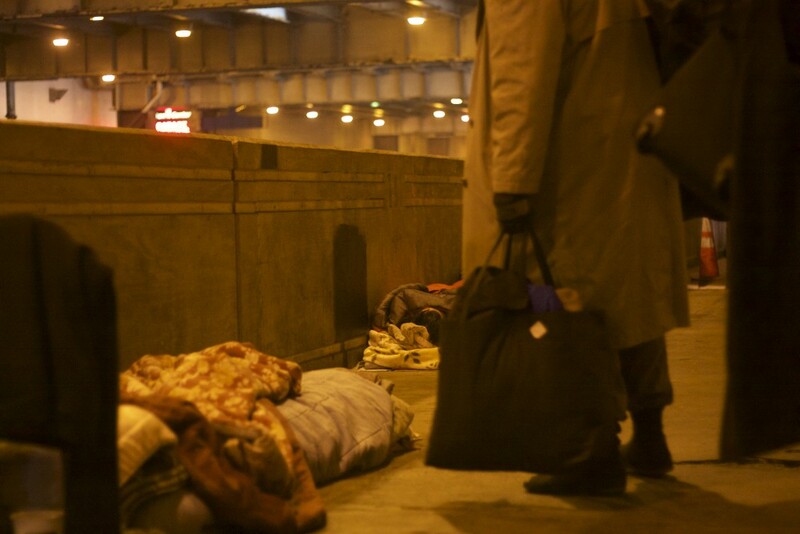 There are thousands who will be sleeping in a car, in a homeless shelter, or even on the cold cement or under a viaduct tonight, tomorrow and for the foreseeable future. And their problems are not solved by the anniversary of the birth of Jesus Christ. But there are some who are taking action to bring at least temporary relief to those down on their luck. All across the country there are small groups of people who call themselves “Real Life Superheroes.” According to Tea Krulos, who wrote a book on them called Heroes In The Night, it is a movement consisting of all types of people who come up with super hero personas, dress up in costumes and try to do good. Most do humanitarian or homeless outreach while others fancy themselves as crime fighters, acting as a cross between the Guardian Angels and Charles Bronson. “I found that there’s a couple different schools of thought about what the movement is all about. Some only do charity type things or humanitarian outreach but then there’s an extreme element of some guys who go out and want to be Batman fighting crime,” Krulos said. Recently, I became aware of two brothers from Northwest Indiana, both in their 40s, who routinely try to bring a smile to the homeless. They do so by providing them with some food, socks, jackets and other needed staples — and they do it anonymously, dressed as super heroes. They allowed me to tag along one Saturday in December. Crusade Prime and Wraith hitting the streets in search of homeless people to help. Photo by Megan Boguszko. The men, who go only by their super hero names of Crusader Prime and Wraith, dress in long overcoats and masks. They also have patches on their shoulders with the initials “RLSH,” short for Real Life Super Hero. I met them in Millennium Park, which was crowded with tourists and Christmas shoppers. They had large suitcases and duffel bags containing packs of goods that they planned to give to the homeless. While waiting for me at our meeting spot in Millennium Park, they had not put on their masks yet — explaining that two grown men with large bags wearing masks during the peak of the Christmas season may scare the public and attract the police. So we walked to Randolph Street, and ventured down into the bowels of the city. We walked down a large staircase and continued down two levels to Lower Randolph Street, which is one of the streets in Chicago’s famous underground street scape, the most famous of which is Lower Wacker Drive. Once down below, the men “masked up” and began to walk, searching for the homeless. It didn’t take long, perhaps a half block, before they stumbled on their first “camp,” a cluster of homeless living along Lower Columbus Drive. There is a large cement wall between the street and the sidewalk that rises about three feet up there. I noticed that the cars zooming by could not see the homeless in that spot who were laying on blankets on the cold, dirty sidewalk. I also couldn’t help but notice the stark contrast of our society. Literally a block away people were walking down Michigan Avenue spending money on frivolous items and laughing it up at Millennium Park. There’s no crime in that of course, but the contrast remains stuck in my head. A small homeless camp. Photo by Megan Boguszko. Crusader Prime and Wraith had bought the items in the packs on their own, which consisted of bottled water, bags of chips and cookies, blankets, socks and hats. It was the afternoon, and some of the camps were empty. It was often hard to tell though, since often we’d see a cluster of blankets and sleeping bags. Sometimes there was a person underneath, other times they had left their home, likely panhandling on the busy streets above. A homeless man receives goods from Crusader Prime. Photo by Megan Boguszko. That day, Crusader Prime and Wraith lugged 80 packs of goods and although turned down by a couple people, were mostly met with smiles and thank yous, many of he homeless recognizing them from previous outreach efforts. By day, Crusader Prime works about 50 hours a week as an executive chef. Wraith is a mechanic at an industrial plant who had just worked an overnight shift. They explained that they’ve been at it for about 5 years now and got into it after reading a couple articles about others doing similar things — which is part of the reason they do it in costume. “It’s fun, it’s a homage to people we want to emulate. It also drives attention. If you give someone a t-shirt or something, in a couple hours they won’t remember who gave it to them. But if you have a squad of five people dressed up in colorful costumes, hopefully it will be noticed and make others take action as well,” Crusader Prime said. 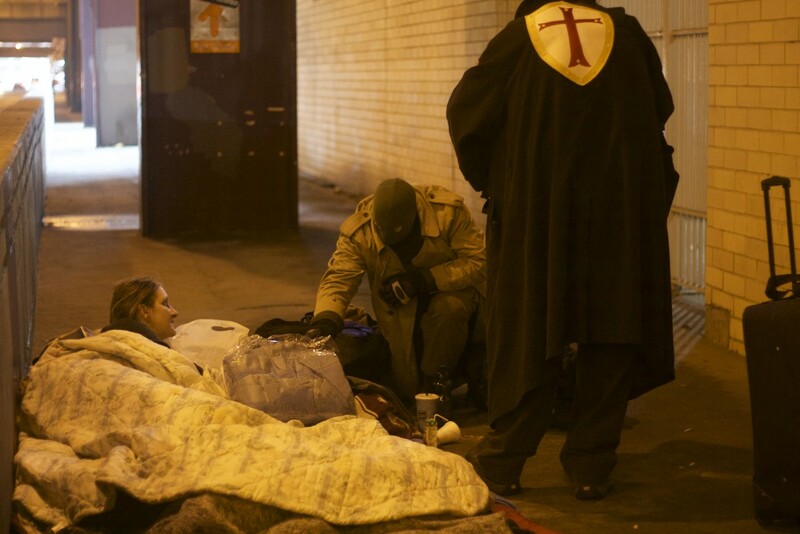 Wraith and Crusader Prime checking on a homeless person. 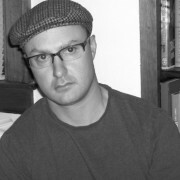 Photo by Megan Boguszko. Being with them for a couple hours I watched the faces of people driving by, often doing double takes. I saw a couple police officers look at them with no reaction and I saw the homeless look at them with recognition and gratitude. And just as the hardships of the homeless are not contained to one day, the efforts of Wraith and Crusader Prime go on. It should be noted that while they personally pay for most of the items that they give the homeless, they are looking for donations for an event in March where they will be joined by several other Real Life Super Heroes. I also realized that they are not super heroes because of a mask or patch on their shoulder. They are super heroes because they are taking the time and effort and spending their own money to do good without recognition. That, to me, is the real spirit of Christmas.